On an autumn hike at the top of Whistler Mountain, just before the first snows fell in October, I was fortunate to be rewarded with incredible views of Singing Pass and Overlord Glacier in the distance. This piece aims to capture the vivid colours and majesty of Singing Pass. Rich undertones and sweeping arcs reflect its vibrant, raw, surreal beauty. Indeed, this land sings, serenading its visitors with wild allure. 24"x24". Acrylic on canvas. $2100. 40"x30". Acrylic on canvas. $2500. 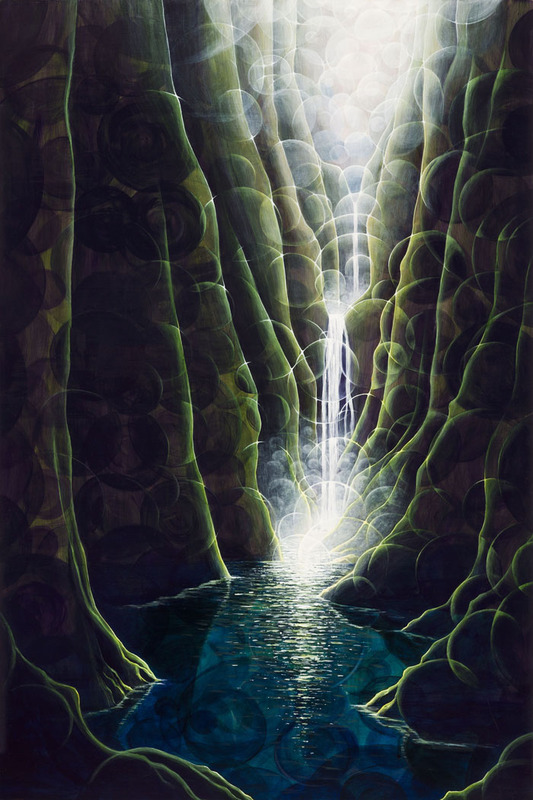 I painted this piece in many, mostly translucent layers to give it tremendous depth, and so that light would play off it as it plays off of mist from a waterfall. I chose to paint on wood because it is in alignment with the nature and feel of the piece. I love circles and built the image using circles because of their profound symbolism: the circle represents wholeness, original perfection, the Self, the infinite, the sacred, eternity, timelessness and God, whatever that means to a person (ie. 'God is a circle whose centre is everywhere and whose circumference is nowhere' - Hermes Trismegistus). In Chinese macrocosmic symbology, it expresses the shape of heaven and perfection as well as eternity. Overall, I wanted the piece to reflect the peace and serenity of that perfect place that mother earth holds for us all somewhere. Somewhere we feel safe, warm and held, as though we are back in the womb. A timeless, meditative space. No stress, no deadlines, no phones, no distractions...the ego is quiet and the mind still. The body, fully relaxed and at ease, bathes in the gentle sounds of flowing water, the soothing scent of mist and pure green earth and the sensation of pure comfort and truth. My hope is that viewers feel a sense of deep tranquility when looking at this piece, which is inspired by the incredible waterfalls on Kauai and in very special corners of British Columbia. The Napali Coast, on the North Shore of Kauai. Near vertical green cliffs plummet thousands of feet into crystal clear blue waters below. White sand beaches, cascading waterfalls, resplendent fruit trees, sea caves and ancient Hawaiian sacred sites reward hikers intrepid enough to brave the narrow 11-mile trail along precipitous ledges to the obscenely picturesque Kalalau valley...one of my favourite places on the planet. Acrylic on Canvas. 15"x30". SOLD. What will you do with your next beautiful, sunny day in the wilderness?